I can almost see your eyes move. I am just waiting for you to come home. "I got it about a year ago. each time you lose someone. Copyright 2008, Kristen Sund. © This work is protected under the U.S. copyright laws. It may not be reproduced, reprinted, reused, or altered without the expressed written permission of the author. Kristen Sund recently graduated from Hampshire College in Amherst, MA, where she studied communications and creative writing. She fell in love with poetry when she was very young and since then has been published in Teen Ink, The Reader, Big Toe Review, and Prick of the Spindle. While at Hampshire College, she worked as the art director and poetry editor for the school's literary magazine. 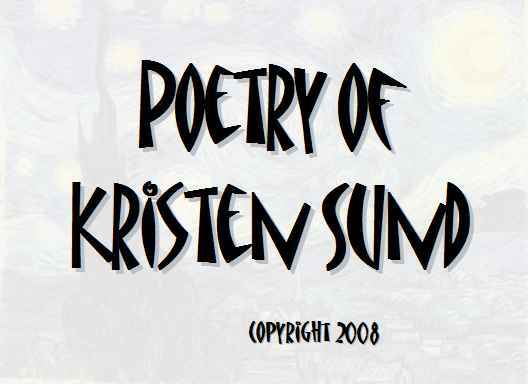 When she is not writing, Kristen works as a graphic designer. As a poet, she finds it hard to write a 100 word bio, and decides that 98 words will have to do.